This badge is way cooler than last year's! 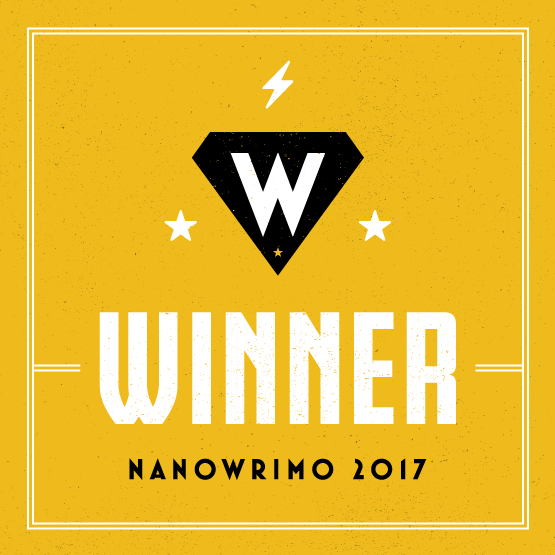 NaNoWriMo: The writing competition with yourself, and a community of fun! My 2016 result: Thoughts from my participation in last year's competition. For those of you that didn't click the second link, last year's efforts were "complete" after 23 days. This year's efforts were more "sane," in that I used almost all of the allotted time to cross the 50,000 word mark. I'm not going to make any excuses, but I *am* going to offer some thoughts, explanations, and insights into what made this year different from last year. First, though, let's see the splits! Here are the interesting metrics from the above table. Writing every day for at least an hour matters. This is actually a maxim for anyone that wants to write well. I'm not even talking about writing to sell stories. I'm saying that the craft of writing is improved by constant and consistent practice. 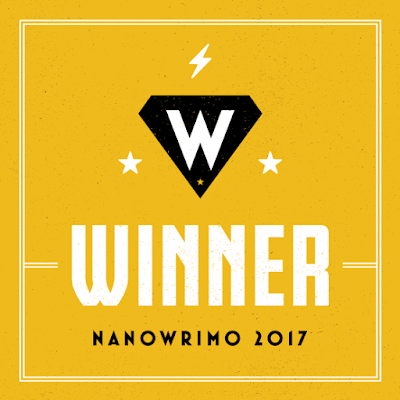 For NaNoWriMo, keeping the foot on the gas matters. Finishing sooner is better. Last year, I finished the Wednesday before Thanksgiving. This year, I had to try to write some over the Thanksgiving break, when everyone else is sleeping off the turkey buzz and/or storming the gates of Black Friday madness. Writing the day of any celebration where you're traveling is tough to pull off properly (as you can see from my 296 word effort on Thanksgiving day). Writing complete crap really is OK. This was hard for me to accept, but there are parts of this story that are piles of steaming hot excrement. There are multiple places where I left "<insert foo here>" and moved on because I didn't know what the "foo" should be at that moment. Ultimately, I figured out where the story was going generally and how to get there for the most part, and that is really all that matters. If you never get as far as the point from the last sentence, you will never write a book. Period. End of story, literally. There are a few other thoughts about and lessons learned from this year as well. Minimizing commitments is crucial. One of the reasons I didn't have as much time and dedication to this year's effort is because I had (and still have) a bunch of other stuff on my plate. I'm training for a half-marathon in March 2018, so we're running four times a week. In fact, we had a 5k race the Saturday after Thanksgiving. I'm hosting and running a D&D campaign for the boys and the Scattershooters (group of friends from way back), and we had the first big story arc for the larger campaign on 11/18 (the day I wrote 0 words). Don't think I wasn't writing that day -- I was picking up the boys and finishing other prep work (15 or so pages of character, setting, and outlines for the first couple of scenarios). Did I mention Thanksgiving? Traveling and spending time with loved ones is a must, and I enjoying being able to do so. Like I said above, having the book "done" before this is a WAY better scenario. Oh yeah, work. Work is still a thing I do for about 1/3 of the day, and it takes up about half of my waking time. Writing regularly throughout the year helps. I've been revising last year's book off and on for the better part of the year, but haven't really been spending dedicated, daily time working on the craft of writing. I think that if I'd been more diligent about that, even as little as fifteen minutes a day doing creative journaling or scene writing or anything, would have put me in a better position than I started in. Pantsing can be frustrating. If you don't know the difference between a Planner and a Pantser, the gist is that a planner plans the story a bit before writing while a pantser flies by the seat of their pants, essentially writing whatever comes into their mind. Stephen King is a famous pantser. He essentially thinks up characters and settings and puts the characters in the settings and writes what he observes happening. I am also a pantser, but I didn't feel nearly as inspired about this year's characters and setting as I was by last year's. As a result, the writing turned into slogging. About halfway through, I knew I didn't even want to finish the story. Take what you're given and be thankful. Even though I wasn't thrilled with the story as I was writing it, some really good things fell out of it. First of all, I should let you know that this story takes place in the same universe as last year's. With that said, I can see how one of the characters from this year's story could cross paths with the protagonists from last year's, and have a fully fleshed out backstory. If nothing else, that's a really good thing. And the characters from this year's story did manage to surprise me a bit. The guy that I was sure was a bad guy from the beginning turned out to not be, and the guy that I was sure was a good guy turned out far darker than I expected. So now that it's done, was it worth it? Yes, definitely so. I needed to make sure that last year wasn't some kind of fluke. I now have two data points: I can write 50,000 in 23 or 28 days. I *can* write a bunch if I really *want* to. It also taught me that I need to vary my approach and style to help keep it fresh. I had the honor of meeting and hanging out a little with Amber Benson in September, who had already given me this advice. Amber, thank you, I'm finally ready to listen. :-) And finally, I apparently do like writing enough to put myself through this two years in a row, and see it through to the end both times.